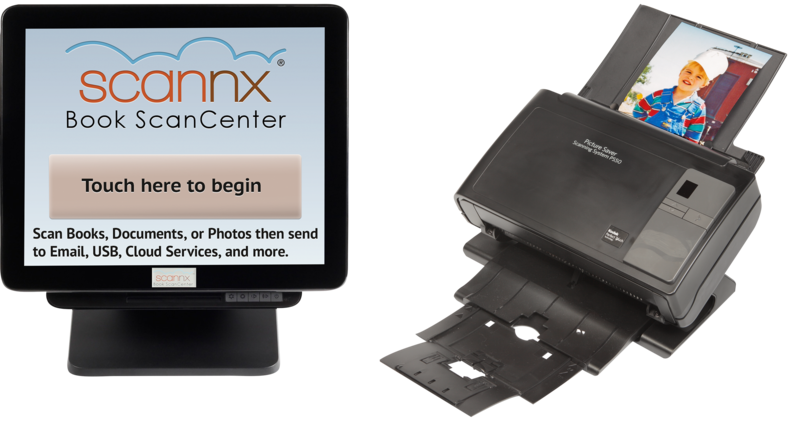 The Scannx Photo ScanCenter is comprised of a Scannx 15" touchscreen PC, a Kodak photo scanner and the Scannx ScanCenter software. It is the industry's most powerful, easy-to-use, self-service photo scanning solution for library patrons. Scans photos up to 8.5 x 34"
Designed with large friendly buttons, the Scannx Photo ScanCenter guides the user through the scan process including choosing the file formats, scan quality, color depth, file naming, and destinations. The system can automatically auto-crop, auto-straighten and auto-orient each photo scanned. Scannalytics tracks usage statistics, enables features remotely, and distributes updates. IT and Accounting departments can use these reports to manage and optimize asset utilization and department chargeback fees. The Photo ScanCenter is integrated with the ABBYY FineReader Engine for unmatched accuracy. ABBYY’s multilingual document recognition engine automatically detects English, French, Italian, German, and Spanish languages. The home screen also provides contrast and magnifying tools for the visually impaired. The Photo ScanCenter supports ITC and Jamex coin and debit card systems and major credit cards. It also works with leading print management vending systems including Pharos, EnvisionWare, and P-Counter. Scannx systems also support card systems from Blackboard and CBORD. The Photo ScanCenter is backed by a one-year manufacturer's warranty that can be extended through Scannxtra Care for up to five years. The unit is supported by Scannx technical support and customer service teams.